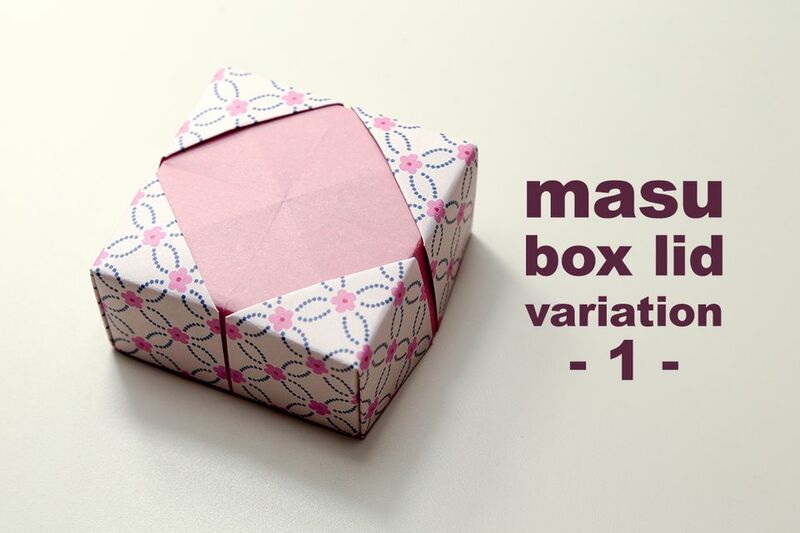 Learn how to make a pretty lid to go on your origami masu box. This origami lid is based upon the traditional origami lotus flower combined with the masu box. You will need one sheet of paper for this lid, we have used 20 x 20 cm. This tutorial is for the lid only, if you'd like to make the base, start with paper that is 13.5 x 13.5 cm - learn how to make the base here. To work out what size you need for the base if your size is different, divide the size you start this lid by 1.42. For example, 20 ÷ 1.42 = 14 cm. You then need to subtract 0.5cm to 1cm depending on the weight of your paper. You can also watch a video tutorial of this model here. 1. Start color or pattern side up. This side will end up as the border of the box. 2. Fold the paper in half and unfold. 3. Fold the paper in half the other way and unfold. 4. You should now have this. 6. Fold all of the corners into the middle. 9. Fold all of the corners into the center. 10. This is what you should now have. 11. Fold the top and bottom edges to the middle and unfold. 12. Fold the left and right edges to the middle and unfold. 13. Unfold the paper completely to the white side. 14. Fold all four corners in, as shown. 15. Fold all four corners in again as shown. 16. This should be your result. 17. Flip the model over to the other side. 18. Refold the top and bottom corners. 19. Ensemble the box by folding the top and bottom edges upwards. 20. Push in the diagonal folds which already exist as shown. 21. Fold the right and left sections over and inside the box. 22. Straighten out the box and you're done!